Final entry to the 2009 diary! I can't believe that 2010 is just around the corner. It doesn't seem long ago that the year 2000 was thought of as the 'future' when people would be wearing silver cat suits and taking all their food in pill form. Fortunately neither the cat suits nor the pill meals ever materialised and we are fortunate enough to have an even wider range of fresh food available to us. The last entry of my 2009 diary has now been posted on the website. Ironically as talks in Copenhagen focused on a strategy to avoid global warming we were harvesting our Christmas vegetables from under the snow in freezing conditions. It was every bird for itself as these sparrows searched for enough water to bathe in. 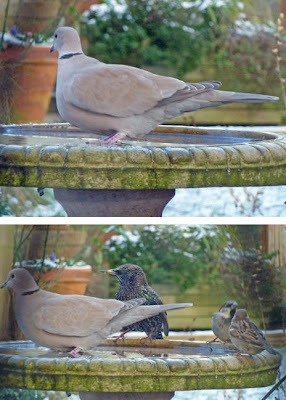 Keeping the bird bath ice free was an impossible task but we at least managed to maintain some sort of water supply. The blackbirds resorted to walking on the frozen pond and drinking from the running water flowing from the filter. Click on the video for a larger view. 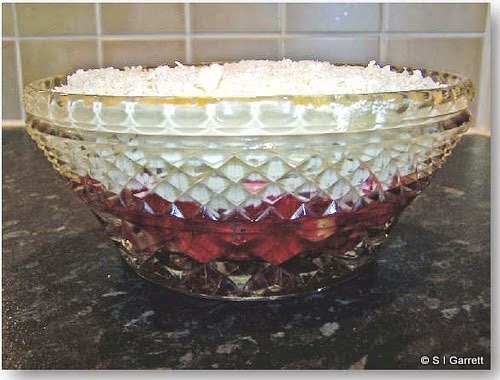 If you are looking for a delicious trifle recipe the Luxury Chocolate and Fruit Trifle which is here on our website is delicious. 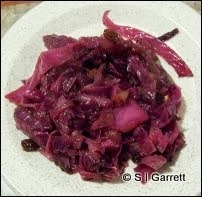 We also enjoy the recipe for Braised Red Cabbage which is also on our website here. Both made with our own fruit and vegetables of course! So what will you be eating? It would be especially interesting to know what our visitors from other countries will be eating over Christmas. Not so green at Green Lane! 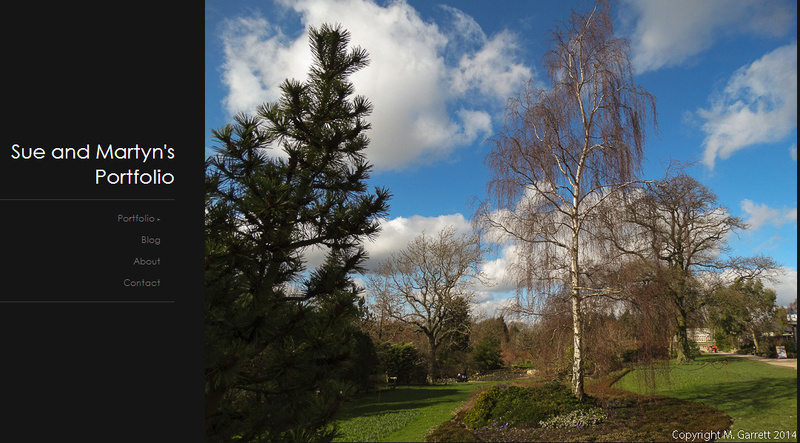 Definitely not a week for being out and about in the garden or on the plot. A wet beginning to the week was followed by our first snow of the season. In terms of inches of snow we haven’t really suffered as badly as most – a few flurries and a light covering. (Click here for our weather blog). Enough to mean that any gardening work would do more harm than good. Tramping on frozen ground can damage the soil structure and also wear away grass from lawned areas. Click here for the update to our December diary complete with a larger version of the above slideshow. 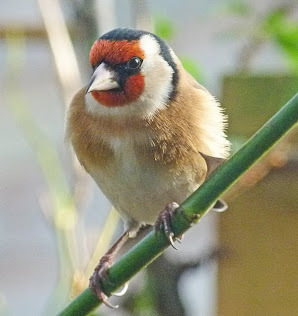 Photo taken last year in our garden. The birds need a bath even in freezing conditions. 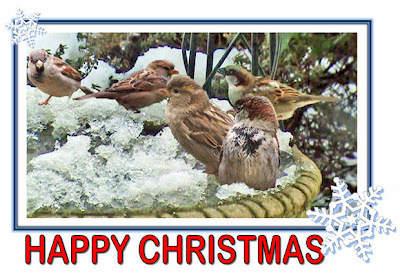 Even though we haven't had much snow here only a bit of a sprinkle (see weather blog) it is below freezing so it is a full time job keeping the ice in the bird bath at bay. Each time the kettle is boiled for a drink I have to pop out and thaw the bird bath. It makes me shudder just watching the birds. I think the doves just have a paddle to warm their feet! Next job is probably making them a Christmas treat or two. Thompson and Morgan's last order date for guaranteed Christmas gift delivery is 9.00am Saturday 19th December. Update of what the crow sees? Google Maps have updated their aerial photos of our area. 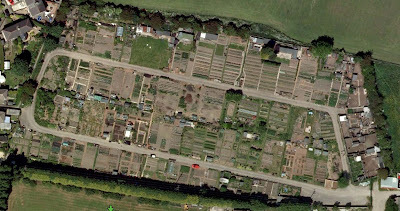 The photo below shows our allotment site as it was last summer. Using the clues in the photo I would guess that this was taken in June 2009. Why June? Looking really closely at the photograph I can make out a brightly coloured patch just where we had a bed of Sweet Williams and these were in full flower in June. Click on the photo for a larger image. and see if you can find them. The sun appears to be coming from the south and the shadows are quite short, only one car is present and I can only manage to spot two people walking around the access road with maybe a dog so I am guessing that this was taken over lunch time when few people were about. Otherwise maybe it is later in the afternoon after most people have left - any ideas? South is the bottom of the photo. There are aerial and bird's eye photos of our site from different years on our web site. Click here to view. 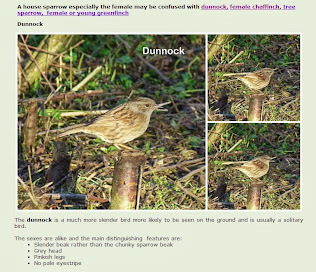 I have updated the December diary on the website. As you may well imagine there has been a very limited amount of activity so to compensate we took some video of our plot. A larger version is on the website. Click here for the web page. Root vegetables come into their own at this time of year and are great for making soups Transferring soup in batches to a food processor and back to a pan is a messy business so I decided a hand held blender would be a good investment. I spent yesterday trying to decide which one I should buy but there are just so many. Has anyone any strong recommendation or even any a warning about which one not to buy? T & M must be reading my posts! 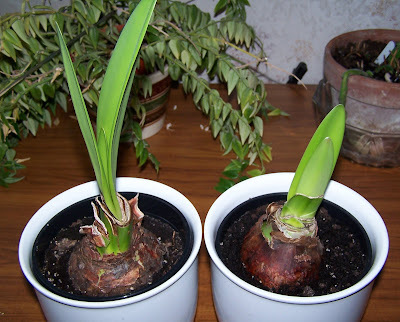 T & M must be reading my posts as they have drastically cut the price of their amaryllis bulbs click here. The most common varieties are £2.99 for a bulb. (I'm not a happy bunny as they are two of the bulbs we bought last month). They also have some more exotic varieties from £4.99 - I'm tempted but my house could end up looking like a jungle. If you do succumb to temptation then send me a picture of your flowers so I can enjoy from a distance! So why do you grow your own? Generally though we grow our own for a wide variety of reasons. Have you a different reason for choosing to grow your own fruit and vegetables? 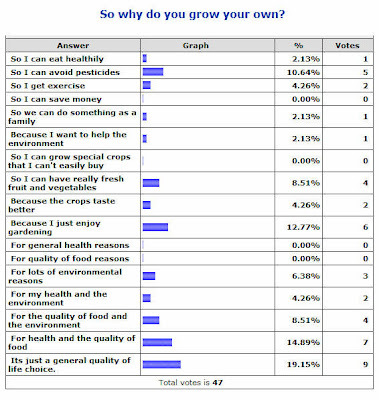 A new poll has been added to the sidebar which links with reason four on the list - will you be using manure this year? If you are wondering why I ask this question then you must have missed all the problems caused by contaminated manure over the past couple of years. If so read this. If you like us are not using manure what will you be using instead? I may just be becoming obsessive but that's what happens when you can't really get out in the garden. Little things assume major importance. This isn't, however such a little thing - just look at my sister's amaryllis (I've now settled on calling it this even if it isn't officially accurate) now! This is after just three weeks. Not that I am giving up without a fight in the first to get a flower competition. Both my bulbs now have buds shooting and one of them now has two. My sister's is a red variety and I have a pink and a white variety. Probably red ones just grow quicker - any excuse! Read the posts below and here if you are suffering from plant growing withdrawal symptoms and are becoming just as obssessive as me and want to follow the saga. Just had a newsletter from T & M Christmas Gifts site. 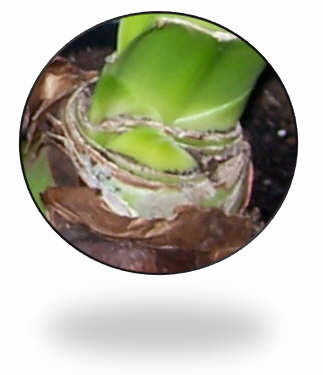 They are offering a free bulb of Amaryllis Evergreen - shown here - when you order a gift from them. The offer ends at midnight of 13 December (Sunday). Believe it or not it is December and 2009 is drawing to a close! December announced its arrival with the first real frost of the year. For the past couple of years this wintery event has followed very close on from bonfire night and has ended our alpine strawberry season. All is fairly quiet on the allotment site when we pay a visit to collect the weekly vegetable supply. The first entry in my December diary is now posted on my website here. Much gardening is confined to indoors and our fairly newly planted hippeastrum/amaryllis bulbs are growing well, one having produced a bud - well if you look really closely a bulb is just beginning to emerge. There's more about amaryllis here on my other blog. Anyone any idea of what this plant is officially called now? It's a bit like the geraniums that are really pelargoniums! Although this plant is commonly referred to as an amaryllis apparently that isn't correct even though it is sold by that name in garden centres etc. Amaryllis grow in South Africa and these bulbs - Hippeastrum - originate from South America. Hippeastrum is a Greek name meaning 'horseman's star'. There are over 75 species but only about three or four are commonly available in garden centres. Other varieties are available online with quite a good range available from here. More exotic varieties are shown on the posting here. In October our plot neighbours shared an order of mushroom growing packs with us. We are growing shitake and our plot neighbours are growing oysters. Our shitake and one batch of oysters came as dowel rods which had been impregnated with mushroom culture. These had to be embedded in holes drilled into a log. We still are waiting patiently for any development. Apparently things should be happening out of sight but it can take a long time before any mushrooms develop. 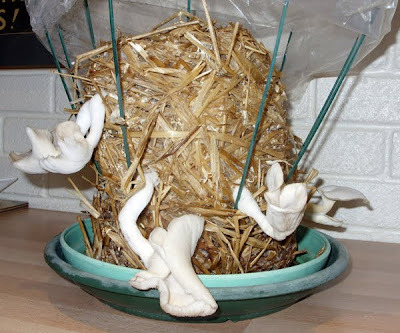 Our neighbours decided to try for the quicker option and also bought a kit that grew mushrooms on a mini bale of straw. These have started to bear fruit as can be seen below! Thompson and Morgan have special offers on all of their mushroom kits at the moment click here to view including the more common varieties. The story that this picture tells is that winter has now really arrived! Up until this week the centres of the alpine strawberry flowers were yellow and fruit was still setting. But on today's visit to the plot there was evidence that the frosts had arrived. 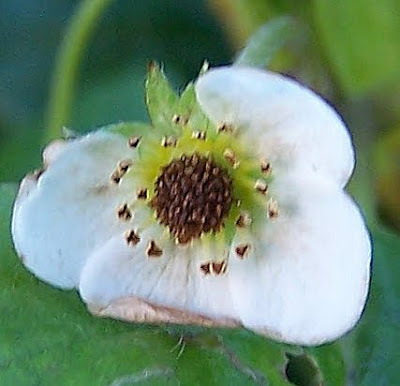 The centres of any open strawberry flowers had turned brown. This is perversely called strawberry black eye. This occurs when the reproductive parts of the strawberry flower have been subjected to frost and killed. They are also offering free UK delivery.